I’m really getting very fond of Rep. Jim Jordan (R-OH). The guy has a spine. He appeared on Fox News Channel’s “Fox & Friends” today and stated that he believes people in the FBI and the Justice Department were involved in “an orchestrated plan” to keep President Donald Trump from becoming President. Yep, they certainly were. That’s called a ‘soft coup’. And there’s more… he went on, “But everything points to — from what we learned several weeks ago that they paid to the dossier to the fact that I believe that fake dossier was used as the basis to get a warrant to now what we learn about Peter Strzok and Bruce Ohr and the FBI and the Justice Department respectively, everything points to the fact that there was an orchestrated plan to try to prevent Donald Trump from becoming the President of the United States.” Imagine, someone with the stones to say it. He’s saying everything that a number of us have been saying for quite a while now. 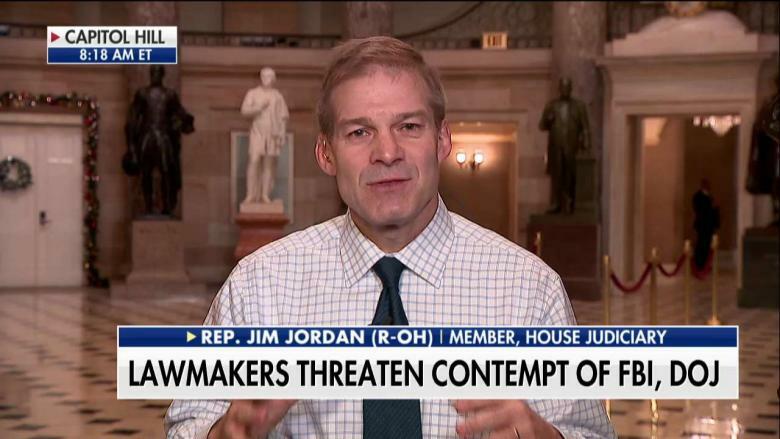 Jordan is right on track here… subpoena these people. Let’s get to the bottom of this crap. Gut the FBI and the DOJ and reboot them. And get rid of every bureaucrat that was connected to Barack Obama while you are at it. That should have been the first thing Trump did when he came into office. We have a subversive enemy from within in the ranks and if we don’t ferret them out, we are going to have a governmental meltdown.